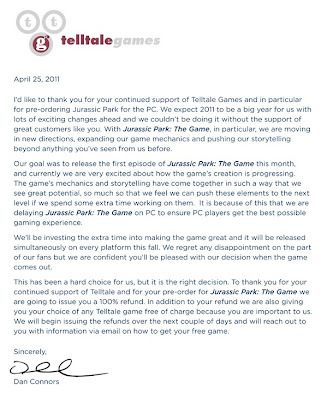 Conners also mentions that due to the inconvenience, Telltale will be issuing a 100% refund for pre-orders of the game and offering a choice of any Telltale game for free. The full letter can be seen below. 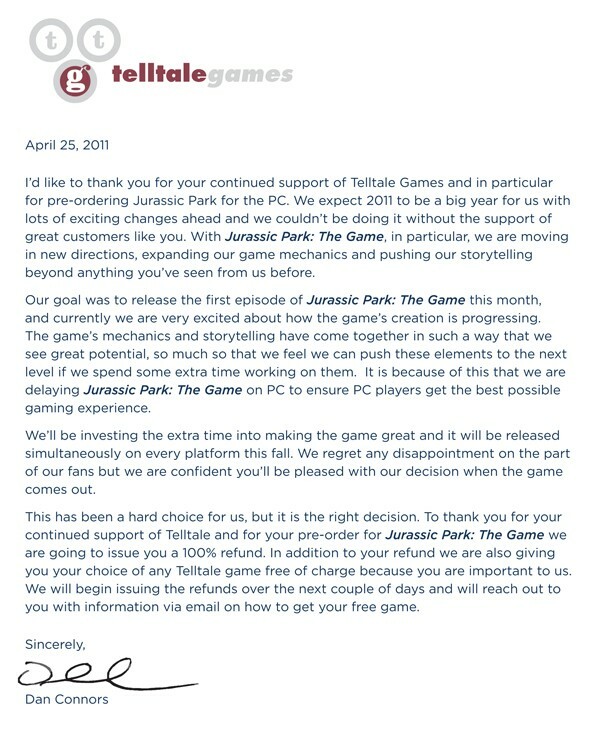 The delay of Jurassic Park: The Game on PC will push its release to coincide with the console version. In addition, Telltale Games just announced today a publishing deal with Microsoft to release games on the Xbox 360, presumably through Xbox Live Arcade. Wallace & Gromit's Grand Adventure was the last Telltale game released on the console, and the new agreement could see episodic seasons pre-sold, similar to Sony's PlayStation Network. "Adding console support to our acknowledged expertise in digital downloads is another positive step in our long-term growth strategy," Connors said, “We are pleased to expand the size of our potential audience by encompassing the Xbox 360 console consumer and bring our vision of video gaming to them." The number of titles Telltale currently has in development is staggering. The list includes The Walking Dead, Jurassic Park, Back to the Future, Hector: Badge of Carnage, Law and Order: Los Angeles, Fables, and King’s Quest. Opening up to new audiences is sure to be a good move for the company.